We have just fount this fantastic Go Karting Track near San Javier Airport. It seem to be very popular but if you go down around 6pm it is a bit quiter. It has 4 different sized go-karts so you can find one suitable for your level of driving even young children. It also has a nice area where you can have a cold drink and watch and even take in a game of pool or darts. 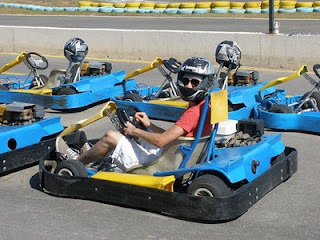 Go Karting Mar Menor for a family day out. Open from 9.00pm to 8.00pm you can pick up provisions for your holiday or even place an order. Owner are called Paul and Sue and are a friendly couple who are there to help you. They have a facility for book lending so you can keep swapping your books throughout your holiday. roda golf shop is just down from the club house and gate house and is a very convenient addition to the 5 star golf course in Murcia. The new Gymnasium is now open on Roda Golf and has plenty of classes for all levels of fitness including Yoga, Pilates and body Pump. It has great views over the lake on roda golf course so if you want to get fit ready for a round of golf then come down and get either a day pass or 4 month pass. Roda Golf Gymnasium has state of the art equipment and fully trained instructors go to our website on roda golf http://www.roda-golf.com/ for more information. Roda Golf Rentals has now listed the Costa Calida trade directory for expats to find local tradesmen in the Costa Calida area, why not take a look and see if it is for you. Why not take a vacation on Roda Golf it is ideal for families and golfers alike and ideal for the sun lovers as it has one of the sunniest healthiest climates of the Costa's. If its the golf you are looking for then roda in my opinion is the best in the area and roda golf apartments are built around it so you get a pool and golf view. Only 5 min walk to the clubhouse and golf and the family will enjoy only a few steps away one of the quietest oasis on roda golf & beach resort on phase II. Well our first blog is to let you know about some of the restaurants local to Roda Golf & Beach Resort. Where to begin is the problem there are so many superb places to dine including snack and tapas bars. Today's post will take you to our main web page with a list of Restaurants in Los Alcazares I will write some more blogs later to tell you about individual bars and restaurants. The main area for dinning is in The Mercadona Plaza which is only 5 min away from Roda come out the main entrance and turn left head over the bridge and on your right you will see the consum super market turn right at this roundabout and you will come to the plaza on your left, plenty of parking around. If you keep walking down the Plaza and across the road and straight on for approx 5 min you come to the Mar Menor Beach front where you will find more bars and places to have a snack and tapas. Log on soon to get more information on the individual restaurants. Hi a big walm welcome to our news blog. This blogger has been created to help anyone that is interested in the Roda Golf & Beach Resort in Murcia. From the lastest news on the resort to the best deals for a golf and beach holidays. We are here to help you. We have a property on the resort and find there is a lack of information out there for visitors and thought that this would help change things.